The Voltigeurs players are either banged up or throwing up and yet somehow they were able to pull out a 3-2 overtime victory over the home team Rimouski Oceanic tonight at the Memorial Cup. And let's be honest - Rimouski dominated Drummondville for most of this game. The first period was spent almost entirely in the Voltigeurs half of the ice, the zamboni may have only needed to flood one side of the rink. The shots on goal after the first period were 11-4 Rimouski thanks to 6 minutes of power play time. I'd say something like "I don't know how the Oceanic didn't have a 3 goal lead going into the second period" but the fact is I do know - his name is Marco Cousineau and tonight he was fantastic! Drummondville's goalie must have been feeling some heat after a forgettable outing on Monday against Kelowna when he was burned 6 times including a couple he'd like to forget. Well he had people forgetting those softies tonight as he stopped 39 of 41 Rimouski shots en route to the win. Rimouski scored the night's first goal just over a minute into the second period and I thought the roof might cave in on the Volts. However, 17-year-old Jonathan Brunelle, a late addition to the game roster, scored a beauty with a nice individual effort. When Dmitri Kulikov struck a few minutes later while on the power play, the Oceanic faithful had to have been questioning the justice of it all. To that point in the hockey game it was Rimouski who had carried the play and had out-chanced and out shot their opponents but just couldn't finish. When Cousineau wasn't robbing them blind the Oceanic were guilty of trying to be too cute - which happened way to much tonight in my opinion. Rimouski did manage to equal the score when Patrice Cormier snapped one home from the slot. Regulation time expired with the score still tied so for the second time in the tournament the Voltigeurs would head to extra time. Final shots in the game were 41-20 in favor of Rimouski but it will be the Oceanic who now have to bounce back from this loss to play Windsor in a tie-breaker game tomorrow. If they win that one it will be right back onto the ice on Friday night for another collision with the Voltigeurs in the semi-final. 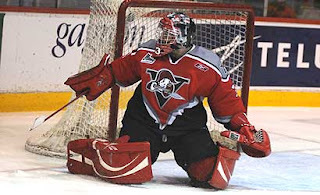 Players of note for Drummondville: Obviously goalie Marco Cousineau (ANH) was sensational and the biggest reason why the Volts will rest until Friday night. Gabriel Dumont is an intriguing player - small but a bulldog that isn't afraid of anything. Dumont is undrafted. Dmitri Kulikov needs to check his equipment because clearly someone had hung a target on his back before the game. The Russian was getting hammered all night long whether it was Cormier or Logan MacMillan's flying elbow at the end of the third period. He was knocked woozy a couple of times but give this guy credit - he's not the stereotypical Euro because not only did he not miss a shift, sometimes he was staying on and playing through the haze he must have been feeling. Top 10 pick this June, no question in my mind. For Rimouski it was the same guys that I've been liking all tournament. Marc-Andre Bourdon (PHI) wasn't as dominant tonight as he was against Windsor (and I hope he returns to that form tomorrow) but he was sound in his defensive play. 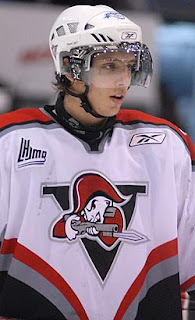 I thought Luca Cunti (TBY) was again the best Oceanic forward on the ice tonight. 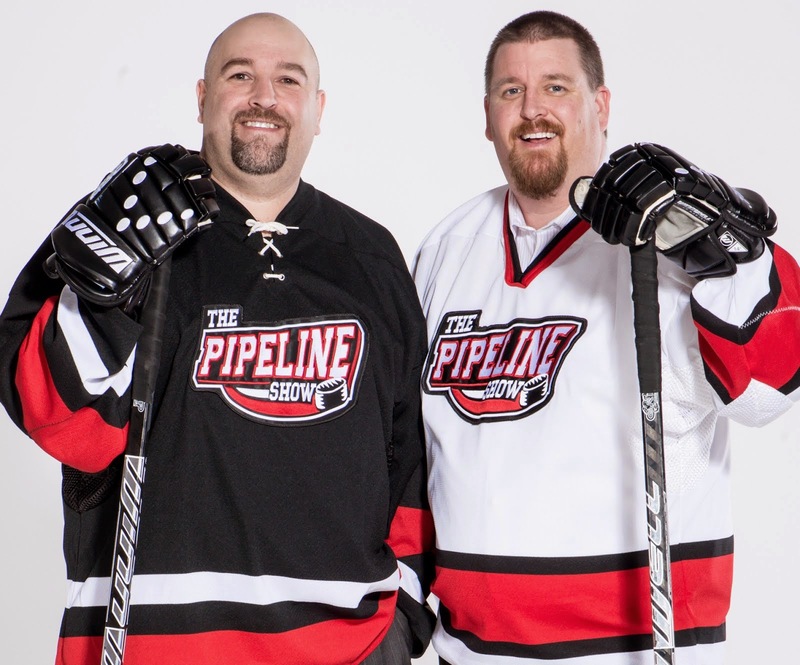 Dean Millard and I argued on last night's show about Keven Veilleux's performance so far. For my money, he's a 6'5 power forward that is playing like he's 5'11... feel free to hit someone. Tonight he passed up several chances to get the puck on net instead opting for a cutesy pass attempt that inevitably failed. I like his size and he appears to be able to skate pretty well but I'd like to see him be more aggressive and take the puck to the net AND SHOOT. Philippe Cornet jumps out every once in a while but for the most part is just one of Rimouski's top 6 forwards - not the performance I was expecting from their leading scorer. He's creative and I like to see that but he doesn't look very strong and I don't know if I've seen him shoot the puck more than twice in the past week. Tomorrow night's game will be interesting. Is Windsor back on track after edging Kelowna (who had nothing on the line Tuesday and played like it)? Can Rimouski bounce back after a loss where they definitely were the better team or has the wind gone out of their sails? Rogers Sportsnet, 5:00 PM Edmonton time (7:00 PM Eastern).